2 Introduction from the Basic Manual supplied WITH your Log Cabin or building using the log construction method. 22.4 Bows in your wall log. 26 Problems, Queries and Support. 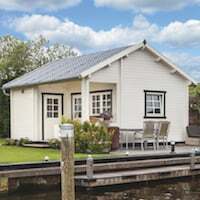 This advice article covers ANY building using the Log Construction Method supplied by us including Saunas, Garages, Log Cabins, Summerhouses and Sheds all using the same method of interlocking construction and interlocking, corner slotted buildings. Please read and follow these instructions in conjunction with the pamphlet and plans that arrive with your cabin – Example of Instructions. Every Link and Article in this Page is Important to your Install – Please take the time to read it so your install goes smoothly. If you would like your building installed for you we can offer installation as a company. 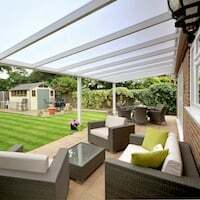 As well as our own Tuin fitting service we also work with self employed installers whom we recommend. Working for themselves our recommended self employed fitters are considerably cheaper and come highly recommended. Details are passed to you on request if you wish to ask the installers for a quote for one of our buildings. We always encourage you to install the log cabin yourself and offer support throughout the process if you need it. It is generally very easy to do! BUT, if anything in this page is not clear. please ask us. Please make sure any Tradesman are given these instructions before working on your building to avoid mistakes in installation. If you have any questions prior or during your install please email us for help. Do not worry if it is out of hours, we will always try to advise you quickly even on a Sunday. MAKE SURE you only follow the schematic elevations such as below found in the plans. Anything else is an example of the installation method. Only follow the elevation plans in any instructions sent. These will show each wall and must be followed for a successful and correct install. Any Isometric images are for an installation overview only. Your plans will always be inside the main package and will be found within the logs. They will NOT be found on the external packaging. If we have sent you plans previously as an example STILL Only follow the plans supplied WITH the building in case of minor variations or design upgrades. Introduction from the Basic Manual supplied WITH your Log Cabin or building using the log construction method. Wood is a completely natural product. We cannot exclude the possibility of minor shrinkage, bending ,warping or small cracks appearing on the surface of your wood. An irregular pattern of side branches is a characteristic of Spruce. Allowing your cabin to get wet or installing in the wet will not affect the build in anyway, it is only you that worries about a ‘Weather Window’ not your cabin. A good base for your cabin is essential for the stability and durability of your log cabin. Only a completely 100% level and supporting base can guarantee a perfect assembly of the wall logs, doors, window frame and roof parts. The minimum base size required is to the advised ‘Footprint’ of the cabin, this is shown on all our log cabin product pages. We advise you to use our foundation beams. These are available in impregnated timber, hardwood and composite material. 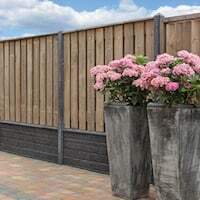 You can also use concrete curbs, sleepers or brick. The purpose of a foundation is to protect the first layer including the door from ground contact. As standard you will receive 44mm x 70mm x 3000mm pressure impregnated beams if no other style has been ordered. There are videos further down the pages showing how best to use the two types of foundation beams. Please also see the notes section for more advice on bases when you are using the profiled foundation beams. Without a good base that is 100% level throughout its entirety and 100% square please expect problems with the installation and possibly the longevity of the log cabin. Your cabin will arrive with a main cabin package. Accessories such as floors, foundation beams, roofing material such felt, shingles, EPDM finial etc will be on top or on a separate pallet. If you have ordered these accessories, a floor, foundations etc please check these against the delivery note and order. Roofing Nails and Tacks will be in a separate pack to the Floor screws and nails (if applicable) Door frame screws will be with the door and window furniture packs in the main package. Identify these before your install. Before you start identify the unique package number found on the labels on the packets and or plans. Keep this number safe as it will be needed in the unlikely event that you need replacement / additional parts or to claim at a later date against faults. Identify your package number before installation and make a note of this. Do not let the sight of so many parts discourage you from the installation. Sorting out these parts into sizes and components will make assembly a lot easier. Use the building plan that comes with your cabin to identify the parts. 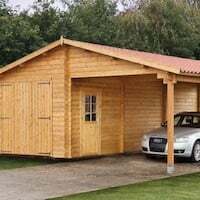 Before you start building please check the parts against the packing list some variations to roof boards amounts may exist do not worry about this as it does vary according to the size of board sent with your log cabin. Often there will be packing pieces which can confuse in identifying parts. Be aware of this. The plans give you an overview of the construction process and will show you the position of each part. Keep referring to the plans throughout your fit. An ability to read plans and understand orientations and elevations within them. Each set of plans will show the position of each log size for a particular wall. You may also require other tools for our buildings such as stanley knives, pilot drills, hole drills, power tools, planer, bits such as torx. All normal tools an average DIYer should carry. It is a good idea to have a tarpaulin(s) to cover the main cabin package on delivery in case there are any knicks in the plastic. It is also useful to have during the build to protect components such as apexes and purlins from the sun or rain. Larger buildings such as Beggren or Edelweiss will require a higher level of skill and understanding and will be harder to install for an inexperienced installer. Please ask us what may be required for a complex install. Screwdriver – A powered screw driver will help with an assortment of bits including Torx and posidrive. Heavy Rubber mallet – Two is ideal. Spirit level – at least four foot long. Ladders / step ladders / scaffold / Harnesses. Wood Clamps and possibly sash clamps / ratchet straps for larger builds. Power tools are useful such as drill, saw or jigsaw. Wood glue and pins may also be useful. We wish you a lot of fun and good luck with the construction of your log cabin. Sort the parts as described in the plan close to your base and stacked on top of each other in the various sizes that make up the cabin. 1. Place the starter logs onto your base. There will be two half logs and two full logs opposite each other. Then put the foundation beams next to them (see further down the page for extended details on foundation beams). Measure, cut and slide them underneath the first logs. The beams will go around the perimeter of the cabin. If necessary use the heavy rubber mallet to knock the logs into position and carry on using this throughout the build. If you do not have a rubber mallet, and instead are using a traditional steel lump hammer, make sure you do not hit the logs directly and use sacrificial timber to protect the tongues. A log can be hit anywhere, not just in the corners. 3. As you build the cabin periodically check the base layer is still square. Ensure you tamp down the logs well as you go. Stop every few layers and check all are going down. Any slight warps or twists can easily be manipulated into position using clamps and your mallet. At around layer five properly square your cabin. 4. Build the walls layer by layer. Be careful where you place the windows and keep following the plan. In most cases if you wish it is possible to place the windows a log higher or lower, please check your plans to see if this is possible. 5. When you are between 3 – 7 logs high, slide the door frame into place. Depending on your cabin the frame and doors maybe in separate packages. If necessary screw the door frame together in the case of double doors. It is a good idea to also glue the four frame parts once you have identified their positioning. Single doors will generally come ready made. With some models of log cabins it is possible to adjust the hinges to ensure the door fits perfectly. With most of the log cabins, if you want to you can install doors and windows after the building install by removing the fascias from one side. This is useful when you want to protect doors and windows from ladder movements. 6. When all the wall logs have been assembled you can place the gables and then nail the roof boards in place. Follow your plans some cabins will feature a bevelled top wall log. Following the gables fit the roof rafters (purlins). A good fitter will always screw the purlins into position for extra security and strength. For apexes we will often screw these together at the ends to aid installation and to stop them moving when the purlins are fitted. This also helps in lateral strength and is only screwed to depths of about 20mm to allow for movement. The roof is finished with tongue and grooved roof boards, when fixing please allow +-2mm for expansion between each board. The last roof board will need to be trimmed. Start assembly of the boards from the front of your log cabin. As you are laying the boards keep checking that the edge of the boards are running parallel. Also check the roof boards are lined up in the centre of a rafter or purlin. Expect to plane the top wall logs / apexes in together for a perfect fit. It is often impossible to finish 100% flush due to variations in your building technique and the timber moisture content. Ensure that all the logs are tamped down as well as possible in the walls during the build and that no swarf is between the logs preventing them from coming down. Ensure your base is 100% level. If it is not this will become very evident at the top logs being uneven. All roof boards are fixed using two nails side by side in the top log and where they cross all rafters. If you have a flat roof log cabin the roof gables are often screwed together for delivery. You will need to unscrew these and take apart to place the roof purlins in. Four sided roofs are a tricky install, the bigger the roof is, the harder it gets, so some logic and thought will be applied. Note: A bad base will cause you problems at roof height with a pyramid roof and will be more noticeable than an apex or flat roof. Look at the plans, there may three of four different sizes of purlins. To start – Identify the longest ones. These are for the corners. Fit these and I recommend always screwing them (screws may not be supplied as they are not strictly necessary – this is a tip and my preference). Fit these to the main cross purlin and level. Pilot all holes! Next find the next size down, these go into the king pins / centre points. Fit and Screw again. Check your levels and Base if you are having problems! Fit the rest of the rafters. Check the plans for measurements of the roof parts. There will often be small differences in each component. It is a good idea to check measurements with a tape measure and grade the parts of the roof. If you cannot understand them start with the corners, then the main cross beam and everything else will become obvious as the roof is built. Ensure your levels are correct from the corner and main cross beam, Fix and then add in the other parts. Try to be methodical when fitting this type of roof, on the big ones it can be a tricky install. For four sided roof boards it is best to tack the first triangle to ensure alignment. Once you are happy with the alignment up and down you can fix and use this roof panel as a template for the others. Boards on a four sided roof may need to be trimmed. It is easier to fit the boards and then trim / cut with a saw / jigsaw or circular saw. Please watch this video completely before carrying out your installation, it is heavily annotated with lots of information including fitting shingles on an apex roof. 95% of this video content is applicable to ALL log cabins including flat roof, pyramid buildings, garages and log cabin style interlocking carports. Regardless of your model of Log Cabin please watch it all the way through to make your install VERY Easy. Fit the leading edge roof trims in the case of an apex log cabin. For pyramid roofs fit the barge boards before applying your roof material. If you have roofing felt, metal roof tiles or shingles you can place them now. 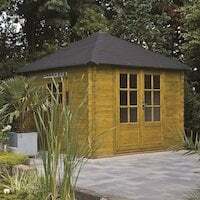 Roofing felt should be self explanatory and it is fitted as you would a shed. One Pack of shingles is enough to cover 3 m² of roof surface. Place the second layer directly on top of the starter course the correct way up (tabs facing down the roof). Off set this strip by half a shingle to cover the gap of the ones below. Work up the roof from the first layer, each shingle strip will overlap the one below. Check your overlap distance is to the tab cut out below. Do not overlap too far or you will run out of shingles. Always nail through two layers of shingles. Use the VERY minimum of three Felt Tack nails that we supply. Do NOT use staples. You do not need to heat up the shingles at all. Felt shingle glue is recommended especially during a winter install as it will take longer for the bitumen strip to melt. All the shingles have a bitumen strip within them. If they are stored in direct sunlight or a hot garage for several weeks they will melt together. Please store them, undercover and shaded and well ventilated. Even when melted they can still be separated with a sharp implement and safely used. Bitumen strips melted together due to storing in heat. These are still quite easy to separate and can still be used. The ridge tiles are cut from the full strip of shingles. Place these over the ridge of the roof and nail in two places. Overlap them similar to the main roof face shingles. Each pack of shingles is enough for about 3.5m of ridge. Roofing felt is very straightforward and is the same principles on a flat roof as it is a apex roof. A 100 – 150mm overlap is usually used with nail spacing of about 50mm apart. This video has some good advice from our roofing material supplier. Please see this page for more advice: Felt Roof Installation. 100 – 150mm overlap of the felt and nails spaced about 50mm apart and close to the join. The video is of an apex roof but all flat roofs follow the same process as one side of an apex roof. The felt can either be rolled over the roof boards and finished with the barge-boards or cut flush with the end of the board. To the rear of the building water can drain away as there will be a gap between the roof boards and the barge-boards. An overhang / fold over of about 50mm is sufficient behind a barge-board. At the corners before folding it, it is a good idea to cut the edge as a curve before folding. If you rip felt a dab of silicone and rubbing felt grit on it will seal your rip. Handle felt carefully! Shingles or EPDM is always a better roofing solution for longevity. Roofing felt only has a life span of two to five years. Trees above it will greatly reduce it’s life. 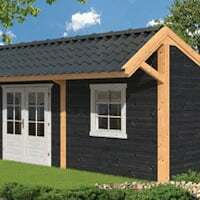 Please see this page for details on installation of EPDM on your Log Cabin. We sell EPDM and this can also be bought elsewhere. For longevity of your flat roof this is Highly Recommended and you should consider this material. Please note shingles, EPDM and Roofing felt will be affected by temperature. In the heat they will be very pliable and loose. Felt can be easily ripped in the heat! In the cold shingles and felt will feel brittle. EPDM will be less pliable in the cold and may need longer to settle to remove the fold lines. 8. Fit the barge boards to the apexes or to the faces in the case of a flat roof. Please note sometimes it is easier to fit fascias on flat roofs as a guide before laying the main roof boards. For Flat roofs the roof boards are always touching the front and side barge boards. To the rear there will be a gap for drainage. 9. Any accessories can now be fitted; Storm kit, metal finials, gutter set etc. Metal finials can be pre-drilled and screwed on or stuck down with bitumen glue. If storm slats are provided and shown on the build plans these MUST be installed. If you have a supporting post it is a good idea to use the optional post adjusters under the post. 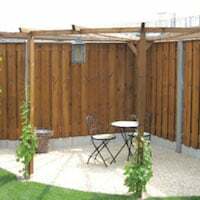 If these are not required please be aware the supporting post will need periodic adjustment to account for natural expansion and contraction in the wall logs. Start with the tongue facing the wall. Interlock each board into each other the same as the roof boards. The last board will need to be cut. Two fixings into each board and each joist. leave a 5 – 10mm gap all around the floor boards. Do not fix the boards to the wall logs. Cover the gap with the skirting. We recommend treating the underside of the floor boards. The floor is a generic floor and is supplied for the area of cabin. The joists can be placed as required and normally 350mm apart. At least one nail should be used where the boards cross a floor joist. Ideally two are used to ensure the floor does not move. The laying of the floor is straightforward and is carried out after the build of the log cabin. this one features insulation in between the floor joists. Alternatively add your own floor to your own design and finish. If a floor is ordered this is NOT for the veranda. For the veranda you would order additional decking or leave as it is. Question 1: The wall boards do not fit into the window and door frames easily. Answer: Our door and window frames are built from assembled parts. Sometimes the wall logs will be tight in the frame depending on the time of year and moisture in the air. You can loosen the fascia fixings increasing the gap slightly. Once the frame is in place re-tighten the fascia fixing. Question 2: There is a gap above the door and windows. Answer: Due to local atmospheric conditions and treatment the log cabin will expand and contract. Each untreated log can expand and contract by as much as 3mm over a year. A log cabin may have 15 logs in a wall, this equates at the maximum an expansion of 45mm. The gap is to allow for this expansion. When a log cabin has been freshly installed this gap may be more and is visible. Lift the door frame so the gap is closed more and put a slither of wood under the frame. Keep the frame square. This may need to be removed when the cabin has settled after a few weeks. Question 3: The door does not close properly and there are gaps surrounding it. Answer: This is normally caused when the door and frame is not at right angles with each other. A slither of wood choking one side can often resolve this. Sometimes the hinges will also need adjustment. You can lift the door off the frame and adjust each hinge by screwing both the door and frame hinges in and out for a perfect fit. Depending on treatment you may need to do this again over the year. Answer: After you have installed your log cabin there will be quite a bit of settlement as each log sinks further into the one below. Settlement can be as much as 100mm and will take a few weeks. Question 5: Will it matter if the cabin gets wet. Answer: None of your build will be affected if it gets wet or is unpacked in the wet and this should not be a cause for concern. It will also not matter if a partial install gets wet. Please allow the timber to naturally dry before applying treatment. We pride ourself on our installation back up service which is why we encourage you to fit your log cabin yourself. If you have any problems during your install and need some help or advise please take a photo of the problem you are seeing and email us with a description of the issue. We have very experienced technicians who will get back to you quickly and often out of normal working hours, evenings, weekends and bank holidays. Our opening hours are 0900 – 1700 Monday to Friday. BUT if you have a problem send us an email and someone will be able to get back to you out of normal opening hours. Videos showing both the standard foundation beams and also the profiled ones.On some buildings you may need to take the upstand off the profiled beams under the door area. For the tanalised and hardwood profiled beams the base needs to be slightly bigger than the footprint. It is a good idea to have a damp proof membrane within your base. If this is not possible use a DPM between the concrete base and the foundation beam. Use this between the foundation beam and the concrete base. This will also compress and with the foundation will help to seal the cabin at the base. Some of the options of laying a DPM with your cabin. It’s a good idea to use a DPC between the foundation and the base to create a good seal. Once you have built your cabin then add a full membrane between the base and floor joists. Adding this before you have finished the build will make working conditions very slippery and you will risk puncturing it. Very brief overview of a pyramid roof, corner log cabin installation. This is similar for a lot of our corner cabins such as the best selling Asmund and Ingrid. Notice though the position of the centre roof block and that it is flush with the top of the rafters. Be aware like other cabins you may see the logs start to bow out as you get higher, do not worry about this as you build. This will pull back when the top log and ring is in place. The triangle above the door can be fixed internally or externally or beaded as you see fit for aesthetics so long as you are not restricting the door frame or the logs from moving. The same guidelines should be followed with a pyramid roof log cabin as an apex building so please still watch the video above. It is easier to join two corner purlins together first. Then the second set. If you have an elongated roof join the cross beam to one side. Using a pole and a clamp you can then set the height – similar to what we are doing here to keep a post height correct. Post and clamp is handy for setting a beam or purlin height. Once the four corners are in and the cross beam or block other rafters can be laid in easily and adjusted square. Another tip is to only tack the corners until you are sure everything is square and happy and then final fix. Call the four corners A, B, C, & D going in a clockwise direction. In order for the corners to be square the diagonal measurement from A to C must be the same as the measurement from B to D. You will have to keep moving point C and D until you get the measurement to be the same. You can also make a builders square using the 3,4,5 rule. Make your square from flat timber, you could use the pallet pieces. Mark the timber exactly with one side 3 units, the other 4 units and the hypotenuse is 5 units. Join them together at these unit measurements and you will form a perfect right angle to use in the corners of the cabin. Making it fairly large will help. Make a builders square to easily square your log cabin. A brief video showing how we do it. There are other ways though but this will help you. Clever fitters will add miters but we’re not that clever. Please see this sketch for the configuration using the frame and fascia boards back and front to secure the frame in place. Do not fix the frame to the wall logs. Fascias can be screwed or nailed as required. 10 – 15mm is enough of an overlap for the fascia and main double door frame. Please note: a frame no matter for what building will always have a threshold, two sides and a door head. Door frame for double doors. Smooth door connection examples in a quick pictorial format to help further. On some of our smaller buildings you will have a part that you may not be able to identify from the plans. This is a window sill and is used inside the cabin you will see this in the corner log cabin video. Window sill found on some of our smaller buildings that you may not be able to identify from the plans. If you are left with parts similar to the below these are glazing bars to create a Georgian effect for the windows if desired – These are used mainly on the 58mm buildings. These are glazing bars to create a Georgian window effect that you may want to use. Unidentified timber is a common occurrence and is mainly packing pieces but are very handy for additional trim as required. If you do not use your cabin often or you do not have a damp proof membrane we highly recommend the installation of our vent to stop condensation. In our climate the wood is exposed to highly varying weather conditions. You should treat your log cabin in the best available timber treatment. NONE of our Log buildings are treated as standard. The colour is a pale Spruce wood as supplied and shown on the main product pictures. ALL BUILDINGS will need a proper timber treatment applied. We also highly recommend Sikkens as a treatment, this is available from lots of outlets but Brewers is the best source of advice. Generally they will advise two coats of preservative followed by two top coats. Please do not be tempted to use anything suitable for fences or sheds, it does not have the properties needed for the care of a log cabin. Regardless of treatment you must attain a treatment depth of 80 – 120 microns to fully protect your log cabin. This is equivalent to two – three coats of a very high quality quality expensive treatment. To attain the same depth with a cheap shed treatment will take 8 – 10 coats. Future problems with timber can always be traced to the quality and level of treatment used on your log cabin. Using a top quality treatment will inhibit the natural movement of wood reducing cracks and splits. 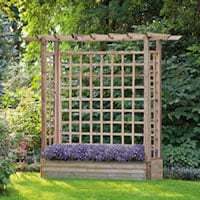 It will also protect your wood from the weather and UV light preventing rotting and fungal attack. Imagine each log is a sponge sucking and expelling moisture. This we need to inhibit with a good treatment. Pay extra attention to cross-cut ends, tongue and grooves, frames and doors. Ideally do this before or directly after installation. Applying treatment quickly will stop movement due to absorption and contraction caused by woods inherent property of moisture transfer from its environment. When you are using a transparent stain make sure you apply it in the direction of the grain. Make sure you apply treatment liberally to all seams, groove and connections to ensure a good seal and prevent water ingress into the joints. Cut, bare parts during installation should be treated. Treating of Doors and Windows inside and outside is HIGHLY recommended. This will reduce the possibility of warps. Be-careful with transparent stains that you actually cover all the areas, this is important for doors and windows as these can be missed close to the glass. If you have a hot tub, sauna or similar always treat inside your log cabin. Ideally remove all window and door fascias and paint behind them to avoid untreated areas when the cabin expands and contracts with the seasons. As we have said, log cabins move. BUT, you can still do some very clever things with them, please see this article for details on how to fit shelves, partition walls and twin skins: Dealing with expansion and contraction in log cabins. Dented timber caused by a miss-hit? Who is installing your log cabin? IKO roof Shingles Far superior to felt and lasts for years. Shingle glue is recommended on the ridges and the exposed sized. Recommended when installing in the winter and Autumn months. 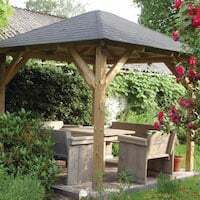 Adjustable Post Supports Recommended when your log cabin has posts supporting a canopy. If you do not use these please build in a mechanism to be able to adjust the post height due to expansion and contraction of the log cabin. – Two Types are available. Metal roof finial Recommended for pyramid roof log cabins. Guttering packs for two side and pyramid roofs. Due to the inherent nature of timber it can exhibit characteristics that can be perceived as a fault. These are not faults. Spruce has considerably less knots than pine and is aesthetically more pleasing and more stable and less prone to warping. Knots will still be present though. Knots will be present in your log cabin – if you find over time a knot opens or splits it is very easy to seal this with a mixture of sawdust and wood glue. It is then almost imperceptible and can be sanded down if the finish is slightly rough. Small splits can occasionally be present due to woods natural movement. Please read this article which explains more on Cracking and Splitting in Timber. A good treatment will prevent this and close up splits very quickly. Wood by it’s nature is susceptible to warping when it is unsupported. Warping can happen to a lesser or greater extent depending on the weather conditions. We have the biggest problems with warps in the highest point of the summer as the heat dries one side below 14% moisture content. If the logs are not stored correctly this will happen with your logs. Keep all logs directly on top of each other and stored flat and level. Unpacking and Installation in the Rain or Snow will NOT have any impact on reducing or increasing warps and bows. High temperature summer days can have an impact as the wood dries too quickly. Protect your logs from the sun on extended fits particularly the purlins as these are the last to be fitted. If your untreated log cabin gets wet during or after the fit at all, this will not affect it in any way if allowed to dry out naturally. Do not worry about rain! Warps and bows are never a problem, if you come across one. Do not worry about it. Wood is very flexible and can easily be pushed or pulled into position. Very Extreme warps can be soaked with water with a weight applied overnight. A warp example. These logs are not being stored correctly. Keep them all flat and on top of each other. This warp was easily manipulated into place and will disappear when supported by upper and lower logs. A warp can easily be pulled and pushed into position, with support from the lower and upper log this will disappear. Bows in your wall log. Sometimes wood can bow in either an upward or downwards direction. If you find such a log use it lower down, with logs and weight on top the bow will disappear very quickly. This includes bows in the top logs, with the roof fitted they will disappear. Example of a downward bow. With logs on top this will quickly close. An extreme upward bow example. Even this is not a problem with other logs put on top. It very quickly goes down. Very occasionally you may find a twist in a log. Like the bows and warps this is caused by wood moving due to absorbing and expelling moisture while unsupported. This is not a problem. Please see this video on the easiest way to deal with a twist in your wall log. There is intentionally a large gap above and to the side of the window and door frames. This is to allow for expansion. This is not a fault. The gap is hidden behind the fascias. This gap can sometimes be quite large when the cabin is first installed, especially if the logs have not been dropped down enough. This will very quickly close up to the proper level over a few weeks as the building settles. If a gap is still showing with the fascia in place add an off cut between the door threshold and base to raise it slightly. Remove this after a few weeks! If you reach this point you will still need to add the fascias to the front and rear of the door frame to create a U section for the logs to sit in. 90% of windows are already made. This is a picture from a Bespoke log cabin. Note the expansion gap either side, there will also be one above the window frame. These gaps are covered by the fascias. As you build up your log cabin you may see your walls starting to bow inwards or outwards. Do not let this worry you as you are building. This is normal and when you push the walls and add the top log, ring beam or apex the walls will become straight again. Walls starting to tilt outwards as the build gets higher, do not worry as the top log will key it all in. The side walls will need pushing in to meet the top log. We use Spruce instead of pine for several reasons and one of them is the likelihood of hidden sap pockets. This is substantially reduced with Spruce. However this is not to say it cannot happen. When it does it is annoying and there is no way we can guard against this within the drying processes or milling process as these pockets are invisible. Sap pockets are invisible during the processes but very occasionally one may erupt during the life of a log cabin. If you find you have a sap pocket open during the life of your cabin you can allow it to dry naturally and then cut the sap off with a stanley blade. Alternatively use a hair-dryer or heat gun. Residue can be cleaned off with white spirits. A few mistakes or assumptions that could be made by you. Your packages are the length of the longest logs and can take up a lot of room. They are also extremely heavy depending on your building. Immediately take in and store undercover the shingles, floor packs and foundation beams (if applicable) Check the log cabin plastic for knicks and tape if needed. This can then be stored outside protected until you are ready to install. Note the package number down in case it is needed later. A log cabin is a substantial package and comes in it’s component parts. Be aware delivery will take place with an articulated lorry, these are substantial vehicles. An articulated lorry is 16.5m long and 2.6m wide. The driver alone is responsible for his and his vehicles health and safety and we cannot influence this. Log cabin deliveries take place with an articulated lorry and a demountable forklift. If you are using our profiled foundation beams you need to make the base slightly bigger to accommodate the overhang. The amount extra will depend on the thickness of the wall log, 28mm it will be a bigger overhang from the stated log cabin footprint. Larger logs and the overhang will be less. Plastic foundation beams have a completely flat bottom. The tongues of the wall logs face upwards. Be careful to identify all the parts from the plans supplied with your building. Upside down wall log. This part would be used above the door. If you think you are missing part of your door frame please check as the door head and door threshold are often inside each other for packing. The door head and door threshold is often sent one inside the other and will slide apart to reveal two parts. Please also check parts are not elsewhere, a customer recently wrote: “My mistake , wife has left them in conservatory, didn’t see them, sorry”. Gaps appearing over time will be caused by logs that have been fixed to the door or window frames or their movement has been restricted in some other way such as electrical components, wall brackets etc. All of the logs need to be able to move independently. 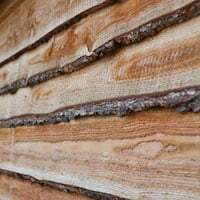 Poor treatment can also cause this as smaller logs will expel moisture quicker than bigger logs if they have not been treated correctly with a depth of 80 – 120 microns (Two – Three coats of High quality treatment) a cheap shed treatment may need up to 10 coats to be effective on log cabins. If you wish to fix items to your walls first create a slotted batton and fix this to the walls and the item to it. If you fix two or more logs together the cabin will split and or have gaps. Always allow room for it’s natural expansion and contraction. Slotted bracket to allow you to fix items to the walls. Fix one end tight and the slotted end loose to allow the logs to still expand and contract unrestricted. Be very careful how you store your logs, try to keep them on top of each not side by side. Do not lean apexes or any logs against anything, everything must be kept flat to avoid creating warps. Do not store your logs like this, keep them stacked on top of each other otherwise you can create warps, twists or bows. A better way to store your logs while building with one on top of each other to avoid warps, bows or twists. Make use of the adjustable hinges when applicable. These will close up the doors and make them fit correctly. Sometimes you will need to do this again depending on the treatment you have used. Use the hinges to adjust your doors to make them fit perfectly. If you do not treat your doors correctly you can expect problems with them in the future. Problems can also occur in unventilated log cabins. Use a high quality treatment outside and preferably inside. This will stop any warps. A warped door caused by a lack of treatment which has allowed the moisture content to change radically creating a warp. Warps can be closed again using a turn button. Warps in doors can be easily solved using a temporary turn button. Turn button applied to the warped area of the door will resolve it over time and after correct treatment has been applied. Take hold of the plunger with pliers or similar, pull out and rotate to the correct orientation and push it back in. There will be some resistance. Please treat the door lock as any other lock, the application of a light oil will help as will WD40 or similar to keep it in good working order. Please apply this during installation and every Six Months. None of our buildings, structures or products comply to building regulations as standard. To comply to building standards other elements will need to be added such as fire proofing, insulation, safety – toughened glass and foundations. Please contact your building control office for the requirements needed to meet building regulations. With our log cabins the floor goes in AFTER the log cabin itself has been built. Do not install your floor and then put the cabin on top of it. Our log cabins have a floating floor inside the cabin and it is installed after the cabin has been built. This is an example of how NOT to lay the floor. Do not use ordinary flooring on a Veranda! An example how NOT to do it. Do not be tempted to overlap your shingles too much, the overlapping shingle should come exactly to the cut out below. Do not overlap your shingles too much, you will run out and distort the design intent. These ones have been overlapped far too much. It cannot be stressed enough how important it is to have a 100% flat and level base in either planes and across it. Without this you will have a myriad of problems installing your cabin and subsequent life of it. Base is very badly out of level in both planes causing huge problems with the install. This log cabin had to be taken down again and rebuilt once the base was correctly laid. Many customers and fitters will do on to further trim their cabin. You can do this inside across the roof corners, outside, you can scallop the bargeboards and make it unique to you. This customer has scalloped thier bargeboards to make it unique to them. Sometimes extra boards are added. Notice also their lovely veranda deck. Other customers will also do the same to their window fascias. We will often trim to make things look nicer and further enhance the building. Sometimes we will also trim around the purlins and eaves. Trimming will often enhance the cabin. You can use left over floor or roof boards / packing pieces to make various trims. It is extremely unlikely you will have any damages but very occasional they can occur. When your cabin arrives inspect the packaging and inform the driver and us of any damage found. Please also send a picture via email straight away and we can advise further. We will also need the package number mentioned above. Damage to the package will be obvious as below. We will always replace damages as quickly as possible. We generally have spare parts in the UK. Doors and windows are held in Holland and will take longer to replace if needed. Very occasionally there maybe other damages / faults such as a split or missing tongue due to packaging straps, when you are unpacking or the very nature of wood rarely are any of these a problem and the following examples can be safely used in a build, they will not affect the aesthetics or integrity of the log cabin and need not be of concern. Broken piece of tongue. Again this can safely be used in the build. Broken knot in a roof board. If you find this consider using it as your last board that you trim. Very often you will find spare boards within the pack. Split groove caused by either the packing straps, unpacking or something dropped on to. This log could still be used without affecting anything. Split to tongues and grooves which has been caused by the packing straps. These can safely be used within the build. All our log cabins are packed very tightly and secure. In the extremely unlikely event you find a crack in the glass please photograph it while it is in the pallet with the pallet and packaging visible and email it to us. We will ask you to obtain it locally and we will reimburse you the cost of the glass ONLY and like for like. We will not pay for installation of the glass by a glazier as this is very easy to do. 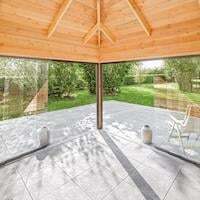 Please note the glass is NOT toughened glass and nor is it required to be for garden buildings in the UK. Replacement glass is generally £10 – £30 from a glass supplier. It is extremely easy to replace by removing the frame beading. Please source from a local glass supplier and send us the receipt via email. Occasionally you can break parts yourself while installing and especially unpacking. One of the most common areas is breaking the tongues as you take the logs from the pallets, it happens to the best of fitters, normally occurs when one end is lifted and the log is interlocked with another in the pack. This is rarely a problem but watch out for it as you unpack..
Split groove in the log during install. This can sometimes happen as you are installing. It’s never a problem and a smear of wood glue will put this right. Some apex parts can be very susceptible to damage. Before you move any part look at it’s structure and support it as you move it. Quite often the points on the apex can be hit. This is rarely a problem and even if it is snapped this can safely be used within the build as all will tie together once the purlins and roof boards are in place. Another example of a broken log, it is easy to break a joint when unpacking or moving logs around but this can be safely used in the build and will not affect anything even if it is completely snapped off. If you have any problems please let me know so I can expand this guide to encompass everything for every building, situation and customer skill set. Please remember though the only thing you need to follow to the letter is the plans received with your log cabin. If you are having any issues with your installation please Email us initially, please include pictures of the issue or problem and let us know a brief description as well as your order number, name and building. Ideally please send these pictures in a large format and also one of the whole install to that point. We will also ask for the building number, below is an example of where to find it. You are of course welcome to call us but we will ask for the above as well so we can understand the issue you are having and offer the best solution and advice. Email is a far quicker way of solving your problem especially if it is out of normal working hours which is 0900 – 1700 Monday to Friday. PLEASE EMAIL: outofhours@tuin.co.uk this is manned by experienced staff on their days off but are happy to help. If you believe you have a damaged / missing part please also report this via email with the building number, pictures and the part referenced from the plans that came with your building. With email we can react extremely quickly to solve your issue – PLEASE EMAIL: outofhours@tuin.co.uk this is manned by experienced staff on their days off but are happy to help. Log cabin package number is required to be able to help you quickly. When you first see the package and open it, seeing all the wood can be rather daunting. But once you have the first few layers down you will understand it a lot more and it will not seem so bad and you’ll enjoy getting to the roof level so quickly. But, if you have any questions at any point please let us know. You may have some leftover parts, packing and of course the pallet itself. You could consider making furniture, planter and even a bar from them. This has got to be my favourite, a bar made from a spare log, pallet and flooring. brilliant! This picture also links to other ideas that may interest you. 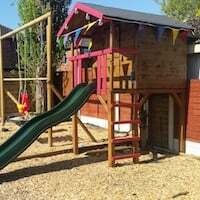 This entry was posted in Log Cabin Fitting Tips, Technical - Log Cabins and Timber and tagged instructions, log cabin, log cabin fitting manual by Richard. Bookmark the permalink. Now I can’t wait for it to be put together which he will be doing while we are away on holiday. I will update when it has been constructed, getting really excited and can’t wait to see it when we get back.